Dalits and minorities in India are the most backward communities, lagging behind not just in various development parameters but also facing hardships securing justice and protecting rights.With a view to protecting and promoting their rights, ActionAid India, with support from the European Commission, is running a project to enhance access to justice and basic services for Dalits and minority groups through advocacy with relevant authorities, capacity-building of the discriminated minority groups and community-led monitoring of implementation of laws, policies and services. The project covers the states of Bihar, Haryana, Rajasthan and Uttar Pradesh. Mobilizing the community and training community-based activists as Human Rights Defenders (HRDs) to engage in advocacy is an important component of the intervention. So far, we have been able to identify more than 300 potential leaders from marginalized communities, including a little less than 150 women. With training underway, the community-based activists have started intervening on issues of human rights violations in their areas. Cases of caste and religion-based atrocities are being monitored, and from May to September 2018, the community-based human rights defenders have been part of more than 50 fact-finding missions into cases of human rights violations. In Ajmer, Rajasthan, human rights defenders supported the case of 41 families belonging to De-Notified Tribes (DNT), who had been evicted by the order of district administration, and have taking up the case with concerned authorities and have asked for an early relief. The intervention also supported these families with food packets for a month. Besides, human rights defenders facilitated the rescue of 14 Dalit bonded labourers, hailing from Madhepura, Bihar, who had been trapped in bonded labour in Jammu & Kashmir. Their rehabilitation process has now started, and our community-based activists are monitoring the progress. Community-based activists have also been closely monitoring cases of sexual abuse to ensure victims get speedy justice. In addition, awareness-building activities have been carried out among vulnerable communities on their rights and entitlements. So far, our intervention has facilitated more than 2,000 community members across the project villages to apply for welfare schemes. 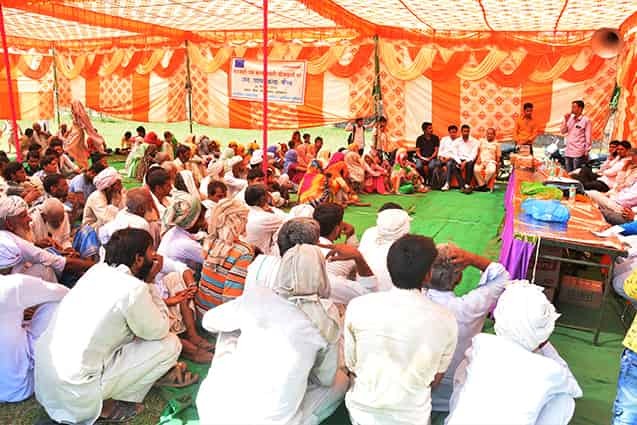 Subsequent to intense advocacy with relevant authorities, hand-pumps have been set up in five villages in Rajasthan, thereby bringing huge relief to nearly 400 DNT families who earlier used to face humiliation and atrocities for taking water from dominant caste hamlets. Besides, the intervention has resulted in a noticeable improvement in two Integrated Child Development Services (ICDS) centres in Mewat, Haryana, thereby benefiting the Muslim community there.